I am a voracious reader, a writer, a chocolate inhaler, and LGBT. I perpetrate geekery, a lover of all things fantasy, scifi, and otherwise odd. 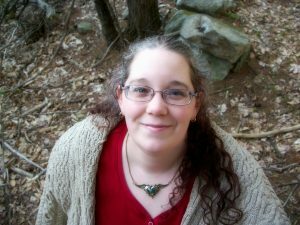 I write speculative fiction that explores themes of individuality, belonging, and empowerment. Lots of ways. I have no problem with getting ideas, it’s having the discipline to sit down and write that is hard for me. Often something random will pop up when I am doing something that has nothing to do with writing that will give me a great idea. I have a writing time most days, but the time depends on the day. I prefer to write in my writerly nest of an office. I often write at the local library, as well. I do have a routine that I usually follow, to try to feed my muse. I will copy a classic I love, currently Fahrenheit 451, for 15 minutes. This is almost meditative. Then I will journal for 15-30 minutes. Then I will dig in, or I will freewrite to myself until whatever I am working on shakes itself out. Getting started is the hard step for me, so I freewrite until I am excited about something. I use Scrivener. I am still experimenting with different methods of pantsing and outlining. I think I’m a hybrid plotter – I outline first, then toss it out when the story changes. Taking that time to outline helps my subconscious develop the story. When I'm freewriting I tend to have a conversation with the character, asking them what they would do. It's really important to figure out what is important to you. I listed all of my favorite books and then researched the common themes. These are the things I can keep writing, and do well. I self-published, I decided to publish myself to get a feel for the process. I think many authors will have a hybrid career. Both self-publishing and traditional publishing have merit, you just have to decide what is best for you and that particular book.